A tangible change in the energy field this month slowly turns the tide of 2018 with this November 7 New Moon. Opportunity and adventure beckon as King Jupiter jumps into fiery Sagittarius, where he rules. Halfway through the month, Mercury turns retrograde in that same sign. It takes more time than we want to get a clear sense of direction. Detours or rerouting are likely. The Full Moon on November 23 is dynamic and very busy, with a push-pull of distractions. Exercise discernment—and exercise, period. Oxygenate your body and intuition. Don’t believe everything you hear. Find the truth in your heart. Before I outline the sequence of changes this month, I want to share one especially lovely feature of this New Moon. Let’s b that Venus is still retrograde for another week. In her own sign of Libra all month, she graciously smoothes things out and seeks agreements— within ourselves first. Venus and Ceres are also in alignment with Spica, the blue white “Gifting Star” in Virgo, representing the sheaf of wheat that she holds, as seed and fruit of Nature’s cycle. 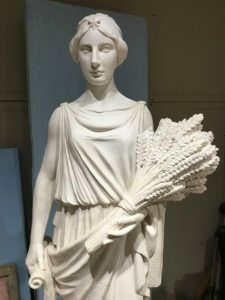 As Goddess of Agriculture, Ceres is also pictured with a sheaf of wheat, indicating a strong emphasis on the Gifts of the Goddess. Astronomically Venus is unusually close to the star. Are you open to receiving their gifts? Have you found some renewed sense of emotional balance that prepare you to recognize potentials and unexpected options that are opening up for you, that can inform the choices and decisions you make? There is a warning that we be careful not to make rash decisions, but to consider deeply what feels truly and deeply right, honorable and appropriate. A smile is a Gift from the Goddess, as referenced by this stellium of influences: Venus, Ceres, and Virgo’s star Spica. Uranus sends up flares, lights more fires and creates a fresh surge of excitement. Yet another lightning storm of incoming plasma waves sweeps in from the center of the galaxy. This Awakener planet of higher mind, turns on dormant brain cells, changing our minds. Rewired and surprised? Invite cosmic spaciousness with an Aries open-minded flare of “tabla rasa,” standing alert with “Be Here Now” attention. Uranus stays in Aries into the New Year. We need this Aries “take two” to be stronger and better prepared when Uranus reenters the fields of Taurus again next March, to plow new territory. We’ll be in new cosmic country by then. Once a year the Big Planet changes sign. This is the day that finds Jupiter in its rulership for the first time in 12 years! Hurrah! The pace picks up with Jupiter’s cheerleading. We are stimulated with visionary fire, enthusiasm and intuitive imagination. Archers, string your bow and sharpen your arrows in readiness. Mercury soon retrogrades in Sagittarius to give us extra time to rewrite the script as we seek our true aim and clear direction. Mars finally leaves Aquarius, where it has largely been since mid-May! Give your mind a break and go with the flow. This has been a transformational Venus retrograde cycle for sure. She will return to Scorpio in early December, showing her spicy side into the new year. Meanwhile she passes the retrograde baton on to Mercury. November 17— Mercury turns retrograde @ 13+ Sag. Eternal truths stand the test of time. Review your unconscious belief systems. Life is not so much about belief systems as it is embodied experience. Mercury agrees that we need to think twice before making hasty decisions. New pathways may call us to an adventure we did not anticipate. Let that smile break through! November 22— The Sun begins its annual visit to Sagittarius and celebrates with a Full Moon the next day. I’ll be back in touch around then…. This Louis Armstrong version of that song will make you smile!